Climate change made a few headlines over the weekend, both in best actor Leo DiCaprio’s Oscars acceptance speech and in Warren Buffett’s annual letter to Berkshire Hathaway shareholders. Buffett said it was understandable that the sponsor of the proxy proposal believes Berkshire is especially threatened by climate change because “we are a huge insurer, covering all sorts of risks”. Such worries might be valid, he said, if Berkshire wrote 10 or 20-year policies at fixed prices. According to Buffett, up to now, climate change has not produced more frequent or more costly hurricanes or other weather-related events. As a result, U.S. super-cat rates have fallen steadily in recent years, which is why Berkshire has backed away from that business. For a broader perspective on how insurers are dealing with climate change risk, check out the Insurance Information Institute’s issues update paper: Climate Change and Insurance Issues. Cybercrime has jumped to the second most reported type of economic crime affecting 32 percent of global businesses, according to a just-released survey by PwC. PwC’s Global Economic Crime Survey 2016 found that while traditional leaders of economic crime–asset misappropriation, bribery and corruption, procurement fraud and accounting fraud–all showed a slight decrease over 2014 statistics, cybercrime is on a steady increase. In fact over one quarter of the 6,000 respondents to PwC’s survey said they’d been affected by cybercrime. Despite a sharply higher incidence of reported cybercrime among PwC’s respondents, the survey found that most companies are still not adequately prepared for–or even understand the risks faced. Only 37 percent of organizations have a cyber incident response plan in place and many boards are not sufficiently proactive regarding cyber threats. Even though boards have a fiduciary responsibility to shareholders when it comes to cyber risk in several countries, PwC found that less than half of board members actually request information about their organization’s state of cyber-readiness. Losses from cybercrime can be heavy, PwC reported. A handful of respondents (around 50 organizations) said they had suffered losses over $5 million. Of these, nearly one-third reported cybercrime-related losses sin excess of $100 million. Reputational damage was considered the most damaging impact of a cyber breach among survey respondents, followed by legal investment and/or enforcement costs. This year’s results show that the incidence of economic crime has come down, for the first time since the global financial crisis of 2008-9 (albeit marginally by 1 percent). Check out the I.I.I. white paper Cyber Risk: Threat and Opportunity for the latest on cybercrime, risks and insurance. Ample capacity and continued competition are expected to continue to put near term downward pressure on insurance rates in major classes of commercial property/casualty business, according to Marsh. However, industry developments including recent earnings announcements, senior management changes and re-underwriting at several companies bear watching, said Marsh in its just-released U.S. Insurance Market Report. Marsh’s analysis put average rate decreases in the fourth quarter of 2015 at between 5 percent and 10 percent for non-catastrophe exposed risks and by between 5 percent and 15 percent for moderately catastrophe-exposed risks. Likewise, U.S. public company directors and officers (D&O) insurance rates were on average flat to down 10 percent in the fourth quarter, while U.S. commercial general liability rates on average renewed at between 10 percent rate decreases and 5 percent increases. Amid the rate decreases across most classes of business, cyber insurance bucked the trend. Typical cyber rate increases in the first half of 2015 were 10 percent to 15 percent over the prior year. However, the retail and healthcare sectors, which have seen some of the costliest data breach events, saw increases ranging from 45 percent to 55 percent and 15 percent to 25 percent, respectively. Marsh noted that demand for cyber insurance rose in 2015–a trend expected to continue in 2016. More information on the cyber insurance market can be found in the Insurance Information Institute white paper Cyber Risks: Threat and Opportunities. My job involves a lot of travel, and the travel tends to be in the spring and the kickoff always seems to be the WCRI conference in Boston, which this year will be March 10 and 11 at the Westin Copley Place. It’s a great place to start. This is my third conference. The first two have been both important and controversial. In (my) year one, Jonathan Gruber spoke about the Affordable Care Act. It generated a lot of media coverage because he is considered one of the big thinkers behind Obamacare and its Massachusetts predecessor. I blogged about it at Terms + Conditions. He said health care reform should help the workers comp system. Fewer workers would be uninsured, and those newly insured would be less likely to try to game their malady into a comp claim. Last year’s conference also had a preview of research that WCRI would release formally later in the year documenting the way that Obamacare’s structure promises to shunt millions of dollars in medical costs onto workers compensation. The short story: Obamacare encourages health plans in which doctors receive a set amount from health insurers for each patient in the doctor’s practice. If one of those patients is a borderline case between workers comp and traditional health insurance, the doctor has an incentive to call it a comp claim–it brings him more money. In his research, Dr. Richard Victor, who then was in his final months as WCRI’s executive director, showed that when presented with a similar health plan–the HMO–doctors appear to behave just that way. Dr. Victor has retired; his replacement is Dr. John Ruser, formerly at the Department of Labor. This year I’m looking forward to a discussion of whether employers should be allowed to opt out of the workers compensation system. An employer that opts out of the comp system still has to provide injured workers protection but can be sued for negligence by injured employees. Texas has always allowed qualified employers to opt out. Oklahoma became the second state to permit opting out with legislation passed in 2014. Opt-out proponents hope Tennessee and South Carolina will be next. Insurers generally oppose opt-out legislation, feeling that the workers comp system remains a fair tradeoff of tort rights for quick, sure recovery in case of injury. WCRI will spend a big part of its first day discussing the issue. One panel will spell out what opt out is and will feature Bill Minick, an attorney who is one of the movement’s strongest promoters. He will be joined by Trey Gillespie of the Property Casualty Insurance Association of America, which looks much more skeptically on the idea. The second panel will include advocates on both sides of the issue, representing insurers, regulators, workers and employers. The highlight of Day Two, for me, will be seeing my boss, Robert Hartwig, speak about how the sharing economy is likely to impact the workers compensation system. The idea: If sharing economy workers are not employees, as companies like Uber contend, they are ineligible for workers comp benefits. What will happen when those workers get hurt? As most insurance observers know, Bob is leaving the I.I.I. in August to join academia–teaching risk management, insurance and finance courses at the University of South Carolina. He is likely the most dynamic speaker in the insurance world, and in the future he won’t be speaking nearly as frequently as he does now (that is unless you become one of his students!) So I plan to enjoy Bob’s show as often as I can the next few months. Details on the conference, including registration information, can be found here. Bitter cold and snow may be in the air for some this Valentine’s weekend, but there’s no better way to stay warm than by checking out these Valentine-themed messages from around the risk and insurance community. First up, the Insurance Information Institute (I.I.I.) reminds us that while there is nothing more romantic than a marriage proposal on Valentine’s Day, getting adequate insurance for that ring will ensure you are financially protected. Next, did you know that every year, thousands of Americans lose billions of dollars by falling victim to romance scams? The Financial Services Roundtable (FSR) warns that nearly every demographic is at risk, but the people who are most susceptible are the elderly and women over 40 who are divorced, widowed or disabled. Among the most common romance scams are malicious actors (scammers) who create fake profiles on dating websites and establish relationships with other site members in order to scam them out of money. Check out this story of the Emoji prince who thinks he’s found true love online, but soon becomes a victim of a romance scam narrated by FSR’s director of fraud risk, Roxane Schneider. Finally, if you’re looking to heat up your romance…or your house…by lighting candles this weekend, the National Fire Protection Association (NFPA) has some timely candle fire safety tips to consider. From 2009-2013, U.S. fire departments responded to an estimated 9,300 home structure fires that were started by candles, causing 86 deaths, 827 injuries and $374 million in direct property damage. On average, 25 home candle fires were reported per day over the five-year period, according to the NFPA. The I.I.I.’s Valentine’s Pinterest Board has additional tips to ensure your loved ones and their valuables are financially protected. Earthquake resilience was in the spotlight as the Obama administration gave its support for an earthquake-alert system on the West Coast at a White House summit Tuesday. President Obama also signed an executive order establishing a federal earthquake risk management standard which will improve the capability of federal buildings to function after a quake. The order requires federal agencies to ensure that federal buildings are constructed or altered using earthquake-resistant design provisions in the most current building codes. A 2015 scientific assessment from the U.S. Geological Survey shows that more than 143 million Americans could experience potentially damaging earthquakes, nearly double the prior 2006 estimate. The ShakeAlert early warning system being developed and tested in the West would warn residents and businesses from at least a few seconds to a few minutes before the shaking starts. This would be enough time to slow and stop trains and taxiing planes, and to prevent cars from entering bridges and tunnels, for example. A common misperception among Americans is that earthquake coverage is provided in a homeowners or business insurance policy. However, standard homeowners, renters and business insurance policies do not cover earthquake damage. Coverage is available either in the form of an endorsement or as a separate policy. Residential earthquake insurance in California is sold through the California Earthquake Authority, a privately funded, publicly managed organization. Some 85 percent of U.S. homeowners said they do not have coverage for earthquake damage in response to the Insurance Information Institute’s (I.I.I.) annual Pulse Survey. The I.I.I. 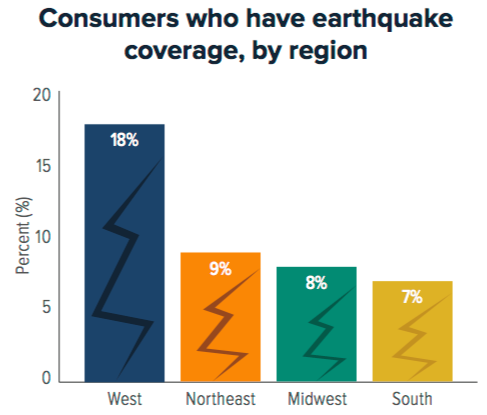 Pulse results showed significant variations in the number of consumers that have earthquake insurance across the U.S.
That number was greatest in the earthquake- prone West, where 18 percent of homeowners said they had purchased separate earthquake insurance coverage. Information on reducing earthquake damage to homes and businesses is available on the Insurance Institute for Business and Home Safety (IBHS) website. The I.I.I. also offers facts and statistics on earthquakes and tsunamis here.